PROPERTY developer I-Berhad is currently in talks with relevant parties to revive its shopping mall project in Shah Alam, Selangor, said its top executive. The i-City mall project was halted last year due to the global financial crisis. It was initially reported that the mall will span about one million square feet, almost equivalent to Mid Valley Megamall in Kuala Lumpur. "We are currently in discussion stage and we will announce the plans when appropriate," chief executive officer Eu Hong Chew said but declined to elaborate further. Earlier reports speculated that Singapore's CapitaLand Ltd would be I-Berhad's foreign partner to help develop the mall. There are currently about four main shopping malls in Shah Alam - Shah Alam City Centre, Plaza Masalam, Kompleks PKNS and Alam Sentral mall. i-City is an estimated RM2 billion project on 29ha that boasts a broadband speed of 20Mbps with fibre optics network and a back-up power supply. The first phase, comprising 6.1ha with 500,000 sq ft of office space, is now 60 per cent occupied. 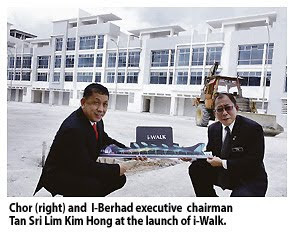 Yesterday, I-Berhad launched a 10,000 sq ft outdoor convention area known as i-Walk. The convention arena is an indoor-type air conditioned environment that is designed with 1,000 programmable LED lights making it an ideal avenue for corporate events or private functions. The i-Walk can accommodate up to 33,000 people at one time and is expected to be ready by the end of December. The project is part of its phase two development covering 3.64ha with a gross development value of over RM150 million. Also present at the event was Minister of Housing and Local Government Datuk Wira Chor Chee Heung. In his speech, Chor praised i-Berhad for providing township services such as landscaping, security, rubbish collection and traffic management within its i-City development. "This is in line with ministry's mission of having human settlements with integral facilities, social and recreational services," he said. An artist’s impression of IJM Land’s RM4.3bil The Light Waterfront phase two project. PETALING JAYA: Market talk of a potential merger, or takeover, involving IJM Land Bhd and Malaysian Resources Corp Bhd (MRCB) has intensified with the suspension of the shares of IJM Land, its parent IJM Corp Bhd and MRCB since 9am yesterday pending a material announcement on a potential corporate exercise. The companies are expected to announce details of the corporate exercise later today. An analyst with a local research house said there was room for consolidation in the local property sector to make way for more competitive and bigger entities in the likes of their better capitalised counterparts in Singapore. There are various possibilities how the exercise will be carried out. One involves the merger of IJM Land and MRCB into a new entity and the other is via the takeover route, he told StarBiz yesterday. He said the rationale for a merger or takeover was for both parties to leverage on each other's strengths and synergies going forward. With the Employees Provident Fund (EPF) having close to a 42% stake in MRCB, he said there was value in MRCB due to its expected involvement or major role in the redevelopment of the Government's land in Sungai Buloh, and a possible strong uplift to the construction order book from the rollout of the 10th Malaysia Plan projects. Another analyst said while MRCB had proven itself in commercial development, especially the award-winning KL Sentral development, its track record in residential development has not been significant. IJM Land, with its good track record in residential projects and township development, will be a good match for MRCB as its expertise will be most valuable to the enlarged group's expanded landbank, he said. The property development arm of IJM Corp has the advantage of a strong brand and is a trusted developer of quality niche properties and new townships. It is well regarded for its township building expertise as well as expertise in building medium to high-end residences and commercial projects. Among its flagship projects are The Light Waterfront project in Penang as well as the Seremban 2 and Shah Alam 2 townships. The analyst said MRCB's advantage of being one of the frontrunners for the redevelopment of the Sungei Buloh land could be the main impetus for the coming together of both companies. We believe MRCB has been helping the EPF in drawing up the masterplan for the 3,300 acres in Sungei Buloh. However, details on the plot ratio, size of initial development, and other issues are not available as yet. But we understand that the Government is expected to announce the award and details by the first quarter of 2011, he added. The Government and the EPF will form a joint venture to promote the development of the Sungei Buloh land into a new hub for the Klang Valley. The land is believed to have a gross development value (GDV) of RM10bil. KL Sentral's development is also progressing well with over RM4bil of GDV having been completed. MRCB, together with its partners, are undertaking RM4.3bil worth of development, to be completed mostly in 2012. Most of the development centres on Lot G, comprising two office towers, one retail mall and a hotel, with a gross floor area of about three million sq ft. The retail mall, to be called Nu Sentral Mall, will be kept for rental income. Two more properties KL Sentral Park and 348 Sentral (office and apartments) would also be injected into its property investment units for rental income. We understand that about 53% of tenants have been secured for KL Sentral Park and Shell would be taking up office space at 348 Sentral, the analyst said. He said there would be about RM6bil worth of GDV remaining for development in KL Sentral with construction to start mostly in 2011 and 2012. This development would include office suites (Lot B), office towers, St Regis Hotel/Residences, and a luxury high-rise development (joint venture with CapitaLand and Quill). The analyst said MRCB was targeting at least RM1bil of new jobs next year. Among others, it is eyeing some portion of the civil works for the RM43bil MRT project proposed by MMC Corp Bhd and Gamuda Bhd. The group is also expecting renewals to environmental projects, including the Sungai Pahang rehabilitation project, which is valued at about RM200mil. It is also looking at RM300mil to RM400mil worth of new transmission jobs from Sabah and Sarawak, he said. Datuk Lim Kang Hoo (right) with Teras Hijaujaya Sdn Bhd director Lim Chern Herng looking at the model of the Danga Utama project. JOHOR BARU: Teras Hijaujaya Sdn Bhd, the developer of commercial project Danga Utama, wants to position the development as the new business hub in the Skudai growth corridor. Chief executive officer Datuk Lim Kang Hoo said the Skudai growth corridor would derive immense benefits from its close proximity to Nusajaya and Danga Bay, the two main growth components in Iskandar Malaysia. Spanning over 9,307ha, Nusajaya is one of the five flagship development zones in Iskandar Malaysia, the country's first economic growth corridor launched in 2006. Our project is located just a few kilometres away from the Skudai exit of the North-South Expressway and Second Link to Singapore and also from Danga Bay, Lim said at the project's launch recently. He said the company had, under phase one, sold 85% of the 129 three-storey shop offices with mezzanine floors priced from RM1.35mil. Other components in phase one include six six-storey corporate office towers with selling prices from RM6.1mil. Lim said the project on a 7.3ha site along Jalan Skudai and Jalan Sutera Danga would be completed in the next four to five years with gross development value of RM500mil. He said phase two would have high-end condominium towers and retail outlets overlooking Sungai Skudai which would be rehabilitated under the 10th Malaysia Plan. The Federal Government has allocated about RM300mil for a comprehensive river beautification programme which include dredging, widening and complete clean-up of filthy rivers in the country. We want to repeat the success of Danga Bay in our Danga Utama project. Phase two will also see us introducing water taxi services from Danga Bay to the project here, said Lim, who is also Danga Bay Sdn Bhd CEO. Located along Jalan Skudai, Danga Bay is now one of the most sought after addresses for waterfront development properties in Johor Baru, with Lim as one of the players behind the transformation of Danga Bay. Upcoming projects in Danga Bay include three hotels, high-end condominiums, a marina, an international convention and exhibition centre, and office towers. Iskandar Regional Development Authority has also chosen a waterfront area in Danga Bay for the wellness township development project in Iskandar. Khazanah Nasional Bhd and Temasek Holdings Ltd will be jointly developing the project on the 202ha site. PETALING JAYA: Mulpha Australia Ltd, a subsidiary of Mulpha International Bhd, is offering exclusive properties for purchase for the first time at Australia's premier island resort, Hayman. In a statement yesterday, it said these residences represented the first private ownership opportunity ever offered at Hayman. It said the first Hayman Private Residence, estimated at about A$18mil, would be delivered this month, making it one of the highest prices paid for a property in Queensland this year. Mulpha Australia head of hotel investment Lloyd Donaldson said the decision to offer premium residential property on the island was due to long-standing interest from frequent visitors. The group, which bought Hayman in 2004, also announced a pre-release of six Hayman Marina Residences to selected Hayman clientele. The Ukay Bistari mixed development project delayed for five years is expected to be completed by July 2011, state housing, building management and squatter affairs committee chairman Iskandar Abdul Samad said. He said three blocks of Ukay Bistari service apartment and management office, namely A, D and E were expected to be completed by next month. Only the external electrical, firefighting, architectural and piping works remain to be done. “The handing over of the units in three blocks to the buyers should be carried out by early next year,” said Iskandar, adding that Block B and C were expected to be completed by February 2011 while Block F was scheduled to be ready by July next year. Iskandar, who visited the project site yesterday, said the 256 low-cost flats units would be completed by January 2011. As for the 60 medium low-cost units and 120 medium-cost units, Iskandar said the sale and purchase agreements for these units would be terminated and the buyers would get a refund. “Buyers will get their refunds plus compensation which comes up to RM5mil,” he said. He said they would be discussing with the Ampang Jaya Municipal Council (MPAJ) to provide the certificate of fitness (CF) for the completed blocks. He said the safety of the buyers will not be compromised. “We will check on the access and hazards,” he said. In response to a question on Ukay Bistari Land Owners’ (PHUKB) intention to vote en bloc for the coalition which successfully resolved their stalled housing woes, Iskandar said the state government’s priority was to complete the project. “We will do our part to ensure the work is completed as it is our responsibility. We are not doing this to secure votes,” he said. According to Block A contractor Abdul Rahman Abdul Manaf, only 20% of works are left to be done. He said if all payments were on schedule, buyers should be able to move in by January next year. “Internally everything is done and we are just left with some external electrical and piping works,” he said. Meanwhile, PHUKB committee chairman Dr Mohamed Rafick Khan Abdul Rahman said he was not keen on the idea of sectional CF for the completed block. “There is no water supply currently and a water tank would be placed to provide water temporarily. He added that on an official level, the committee would have to discuss further with the local authorities and state conditions with regards to the CF. It was reported that the project was launched in August 2003 with scheduled completion between August 2005 and June 2007. A total of 353 units of the double-storey houses were completed in October 2006 while another 103 units were completed in May 2008. The entity that will emerge from the proposed merger between IJM Land Bhd and Malaysian Resources Corp Bhd (MRCB) will be a mega property owner and developer with an implied market value of RM7 billion. IJM Land chairman, Datuk Krishnan Tan Boon Seng, said the entity was also expected to expand its presence not only in Malaysia but also in the region. He said the creation of a leading listed property development entity would provide a platform for both parties to tap each other's strengths and capabilities. "The proposed merger is also expected to provide an opportunity for both entities in terms of product offerings, land bank, management expertise and regional expansion plans," he told reporters after signing the memorandum of understanding with MRCB on the merger today. Tan said the merged entity would benefit from better project management practices which were expected to give rise to improved operational efficiencies and economies of scale. "By leveraging on each other’s core competencies, over time, the value of the merged entity can be further enhanced through the adoption of best practices currently being practised by IJM Land and MRCB respectively," he said. Meanwhile, MRCB chief executive officer, Mohamed Razeek Hussain, said the merged entity would also be well-placed to pursue strategies that could propel its future growth on the back of a combined net assets in excess of RM3 billion. "With the significant increase in size, the merged group will be able to further strengthen its market leadership in the commercial and residential segments of the property market and compete more effectively in both the local and international markets," he said. The proposed merger was expected to be finalised within three weeks, Tan said. Mohamed Razeek said the merged group was expected to have a combined landbank of over 3,600 hectares with presence in the Klang Valley, Penang, Johor, Perak, Negeri Sembilan, Sabah and Sarawak. The principal activity of IJM Land is investment holding while its units are involved in property development, construction, hotel operations and investment holding while MRCB is engaged in construction-related activities, infrastructure, property development and investment and provision of management services to its subsidiaries. In a filing to Bursa Malaysia, the companies said the proposed merger would be implemented through a scheme of arrangement under Section 176 of the Act. For the purpose of the scheme of arrangement, a newly-incorporated company would be formed (newco) to facilitate the proposed merger. The shares in IJM Land and MRCB will be exchanged for securities in newco or a combination of shares in newco and cash. The exchange will be based on RM3.65 per share in IJM Land and RM2.30 per share in MRCB. The newco is to be admitted to the Official List of Bursa Securities upon completion of the proposed merger, in place of IJM Land and MRCB. The proposed merger is subjected to approvals from the boards of directors of IJM Land and MRCB, shareholders of both companies and the relevant authorities. RHB Investment Bank and Newfields Advisors have been appointed joint advisers to both the companies. MALAYSIAN Resources Corp Bhd’s (MRCB) third quarter net profit fell by 63 per cent to RM3.7 million despite higher revenue. Group pre-tax profit, however, increased by a quarter to RM15 million, helped by its ongoing property projects at Kuala Lumpur Sentral in Kuala Lumpur, MRCB said in its announcement. Its revenue increased by 5.4 per cent to RM270.9 million. For the nine months to date, MRCB’s net profit increased by 16 per cent to RM25.8 million. BEIJING: Some of China's top trust companies have halted property-related lending and investment following a regulatory order, four sources told Reuters yesterday. Seeing risks in rapid credit expansion to real estate projects, the China Banking Regulatory Commission (CBRC) last week instructed trust firms to assess the risks posed by their portfolios in a fresh move to rein in the red-hot property market. The CBRC ordered a self-examination last Friday in a document, and our application to invest in a property project was turned down by our company on the same day. I don't know whether it's a regulatory requirement or a decision by the company, a source at Ping An Trust told Reuters yesterday. Two sources close to Zhongrong International Trust cited a company document as saying that it had halted all new plans to invest in the property sector, except affordable housing a niche strongly supported by the government. 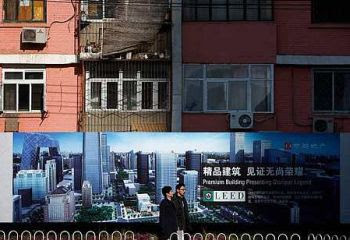 One of the sources added that China might order a complete halt to all property-related businesses by trust firms. A source at China Credit Trust Co Ltd said his company had adopted a more prudent approach following the CBRC's order but had not yet halted property business. Funds from trust companies have been an important alternative channel for Chinese developers to raise capital as the country has tightened controls on bank lending. Trust companies are hybrid institutions combining features of commercial bank lending, private equity and asset management. Until recently they had been loosely regulated and had expanded rapidly. By repackaging loans into equity- or fixed-income-linked products, trusts have been able to offer bank clients, typically rich individuals, much more attractive yields than are available on certificates of deposit. The CBRC in July ordered trust companies to halt the launch of wealth-management products via banks. Property-related trust investment totalled 150 billion yuan (US$22.6bil) in the first 10 months of this year, compared with 40 billion yuan in the whole of 2009, according to Use Trust Studio, a private data provider. Uptrend Housing Development Sdn Bhd, a wholly-owned unit of Mah Sing Group Bhd, has acquired 24.41 hectares of freehold land in Batu Feringgi, Penang, for RM157.3 million in cash. In a statement here today, Mah Sing said the land would be developed into a resort-style project named, Feringgi Residence@Penang, with an estimated gross development value of RM800 million.